And they want to con the Christian man into going along with it by working at his conscience. They get a terrifying amount of help from pulpits across America. Far too many priests and ministers can’t seem to keep their politics out of their preaching. 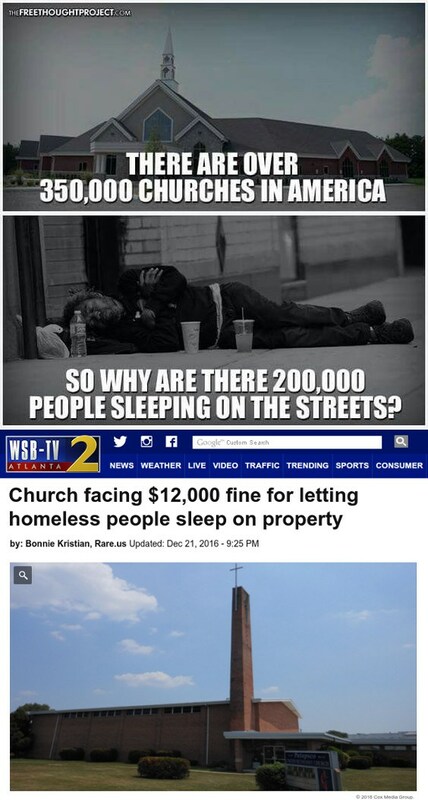 Churchians, every one of them. The Pharisees would know them as their own. People like Buffett, Gates, etc who make major donations of their wealth to ‘charity funds’ are actually taking advantage of a tax dodge which, over time, INCREASES THEIR OVERALL WEALTH. And…they always make their donations a press conference of national notice rather than doing it personally. Similarly like a WalMart announcing it will hike their minimum wage, they ‘can’ afford it but the corner independent retailer? Not so much. Thanks for the reference to Matt 6:2 and Robin Hood. There was something bothering me about this give to government meme other than it’s Socialistic but I couldn’t put my finger on it even though I know those references well. All robbers look down on you while they rip you off whether a punk thug or a politician. The difference is the thug doesn’t pretend to be helping anyone but himself. If you want to expose these phonies just check how much they donate to charity. It’s always a smaller amount percentage wise than most non progressives. The ministers who go along with the progressive meme are the worst of the lot. They are nothing more than modern day Pharisees. The discussion turned to the federal budget and began focusing on Trump’s budget cutting efforts. The leftie woman immediately took the tack that since Trump’s budget proposal cuts school lunch programs, it shows how people of the right like taking food away from poor kids. A little datapoint: more children live below the poverty level NOW than in 2009, at the height of the last official recession. All of the $T’s of debt accumulated thru Obama’s entitlement programs and their increases didn’t help poor kids – it made more of them, and made them worse off. But it doesn’t matter to people like Progressive Church Lady. The smear is what matters. I’ve lost all patience with this. I find myself turning off the radio and the TV and avoiding websites with any sort of political content. I can envision myself turning into the kind of guy that even Ted Kazynski would find too much of a wierdo loner to be around. The appearance matters more to them than the reality. And given the propensity of the media to make anything Right-wing look bad, and anything Left-wing look good, we have a situation where what looks good to the average idiot is always Leftist. As you say, the smear is what matters, not the reality. For the longest time, Rightists thought this was the path to defeating the Left: showing that Leftism actually hurts the very same people it purports to help. But with a hostile media establishment, this effort is doomed to failure. The correct play now is NOT to play. The Left is cheating, so don’t play the game. It’s sad that this is what it has come to. Clean up your language, please. It does not enhance your thoughts. I will politely decline. I find that colorful language has its occasional use. Not all my posts contain it, but some will, where I deem it to be appropriate. While I would, of course, prefer additional readers, all things being equal, I’ve no interest in policing my thoughts or language in order to do it. I’ve been down that road before, and I’ve no use for it. 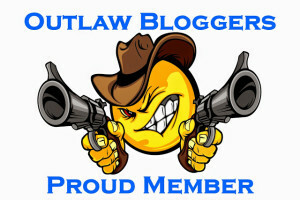 If this bothers you, then my blog is not for you, I’m afraid, and I wish you well. Yes, the ministers who do this are knowing accomplices of the enemy. They’ve sold their souls. Bible also says, ‘a man who won’t work is a man who won’t eat’, either! Well stated. 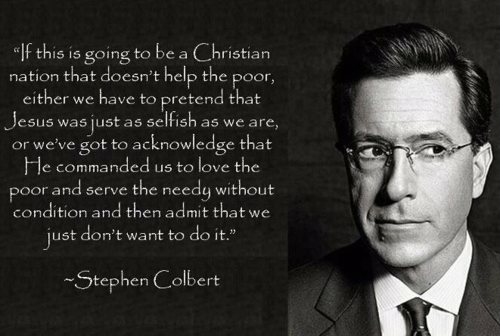 That is what Colbert’s nauseating, holier-than-thou “virtue signaling” is actually saying. I heard the term “moral preening” more than once, and it works also. Anyone remember Bluto from “Animal House”? He would know how to deal with SJWs and other progressive poser passive aggressive fascist types. We need to channel BLUTO. Not apropos this post, but consider deleting “in” from your motto. Feds take about 24% of GDP (yes; borrowing is just taxation deferred). State and local another 15%. Total about 40% of everything. That’s tithing FIVE times over. Hint; 0.9 times itself five times is 0.59. So how much of the entire economy would be enough for the Left? That’s like asking how much cocaine would a crack head do. All of it. Why does Stephen Colbert have $45 MILLION DOLLARS when there are still poor people in the world? Why?